The road of life is uncharted and full of unknown obstacles. So why settle for anything but the best? Choose the 2019 Mazda CX-9 and tackle anything life can throw at you with dynamic performance, cutting-edge technology and award-winning safety. There’s no comparison because the 2019 Mazda CX-9 blows away competition like the Honda Pilot and Toyota Highlander. So why choose anything else? 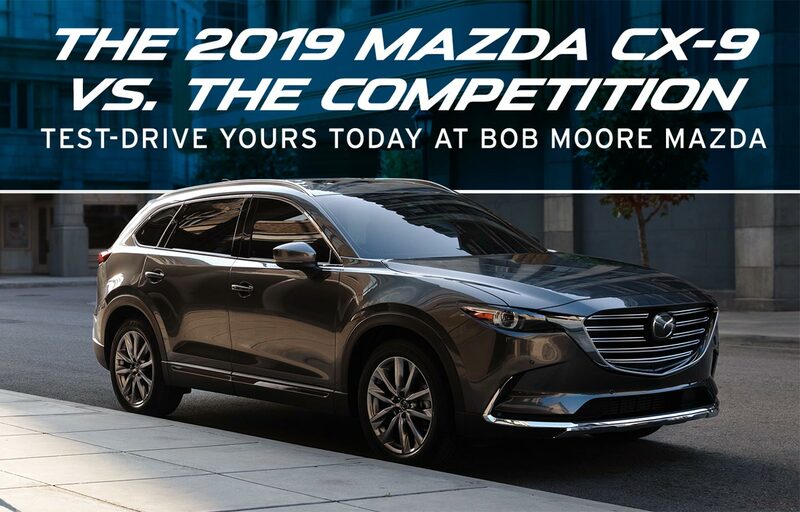 Visit Bob Moore Mazda to test-drive the 2019 Mazda CX-9 and experience the difference. The 2019 Mazda CX-9 makes itself known wherever you drive thanks to its exciting performance. Whether you’re forging new trails off-road or taking it for a quick trip to the store, the CX-9 provides ample ways to sustain your adrenaline rush thanks to its powerful SKYACTIV® G2.5T engine, which outputs 250 horsepower and 310 lbs.-ft. of torque. The Honda Pilot and Toyota Highlander lag behind this with only 262 lbs.-ft. of torque for the Honda Pilot and a paltry 184 lbs.-ft. of torque for the Toyota Highlander. But what is power without control? Temper the exhilaration with superior handling and control with SKYACTIV® TECHNOLOGY with g-vectoring control to ensure that you always are in complete control of your CX-9, no matter where you roam. Only the most cutting-edge features make it into the 2019 Mazda CX-9, and they are made to excite. Enjoy seamless connectivity wherever you go with MAZDA CONNECT™. This infotainment center gives you unprecedented control over all multimedia functions from one simple place. Access navigation, apps and more via this simple tool. And it’s exclusive to Mazda – you won’t find this on the Honda Pilot or Toyota Highlander. Safety never takes a back seat in the 2019 Mazda CX-9. It received both a 5-Star Overall Safety Rating from NHTSA and also is a 2019 IIHS Top Safety Pick, so you can count on the 2019 Mazda CX-9 to keep you and your family safe. Plus, take advantage of standard active safety tech like Blind Spot Monitoring, Rear Cross Traffic Alert, Advanced Smart City Brake Support and Low-Speed Automatic Emergency Braking that help make every ride safer than competitors like the Honda Pilot and Toyota Highlander. It’s perfectly clear – the competition just can’t stand up. The 2019 Mazda CX-9 shines through on performance, infotainment and safety in ways the Honda Pilot and Toyota Highlander just can’t. Take your test-drive of the 2019 Mazda CX-9 today at Bob Moore Mazda.